SectorSurfer provides automated strategy investment analysis and trade advice that levels the playing field by putting the power of sophisticated investment algorithms in your hands. With just a few trades per year, a SectorSurfer True Sector Rotation Strategy holds only the momentum leader during bull markets, and its StormGuardTM algorithm moves you to safe alternatives during bear markets. SectorSurfer's trend-following algorithms were specifically designed to help you manage self-directed 401(k) investments and IRA investments without turning you into a day-trader. An email Trade Alert is sent when a trade is signaled, just a few times per year. A SectorSurfer Strategy consists of a selection of up to 12 stocks, mutual funds, or ETFs chosen to manage an investment account. For example, the Strategy may focus on country funds, sector funds, conservative bonds, or individual stocks. After selecting up to a dozen funds/stocks for your Strategy, it's SectorSurfer's job to use its True Sector Rotation algorithms to determine which one (and only one) of the dozen to own at any given time. It is only by owning the top trend leader and avoiding the trend laggards that you can simultaneously improve your investment returns and reduce the probability of year-over-year loss. • FREE Strategies answer the basic question: Stocks? Bonds? or Cash? Our ready-made FREE Strategies perform much better than market averages, such as the S&P 500 index and may be used by anyone without limit absolutely free of charge. 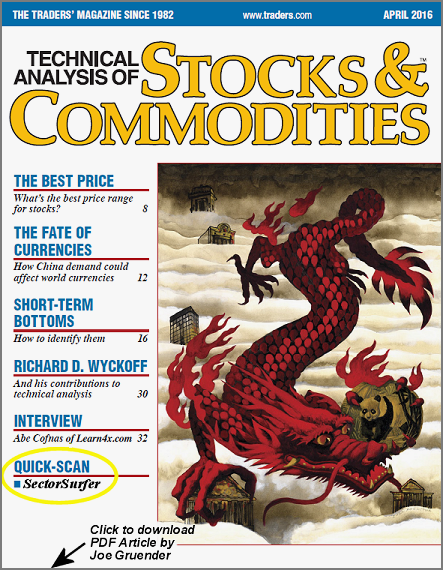 • Premium Strategies unleash the full potential of SectorSurfer's algorithms. Our ready-made Premium Strategies for mutual funds, ETFs and stocks perform much better than FREE Strategies and are available for a small monthly subscription fee. The Strategies listed in the table below may be fully used by anyone absolutely FREE of charge. These mutual fund Strategies include two primary types: (a) basic asset class Strategies (stocks, bonds, and cash) that have produced about 12% - 14% return over the last 15 years while substantially avoiding the punishing market downturns during that period, and (b) basic conservative financial sector Strategies (bonds, mortgage securities, and treasuries) that have produced about 7% to 10% over the last 15 years and are substantially immune to the volatility of the equity markets. To use one of these Strategies in your SectorSurfer Portfolio, go to your My Strategies page and import it to your personal Strategies by clicking the Strategy icon and selecting the Strategy from the list. SectorSurfer is now ready to track this Strategy daily and send you email Trade Alerts when a fund trade signal is generated by the Strategy. The Premium Strategies in the table below have premium performance relative to the FREE Strategies above. Anyone may freely evaluate these 90-day-old charts for these Strategies at any time, but to view current charts and receive email Trade Alert notification requires payment a small monthly subscription fee. Premium Strategies were specifically designed to contain either diverse asset classes, focused market sectors, world countries/regions, or a mixed combination of these so that SectorSurfer's sector rotation and country rotation algorithms have the best opportunity to select the top trend setters for your portfolio. For those seeking alpha as a measure of performance, SectorSurfer Strategies will surpass your expectations. Alpha is a risk-adjusted measure of the so-called active return on an investment. 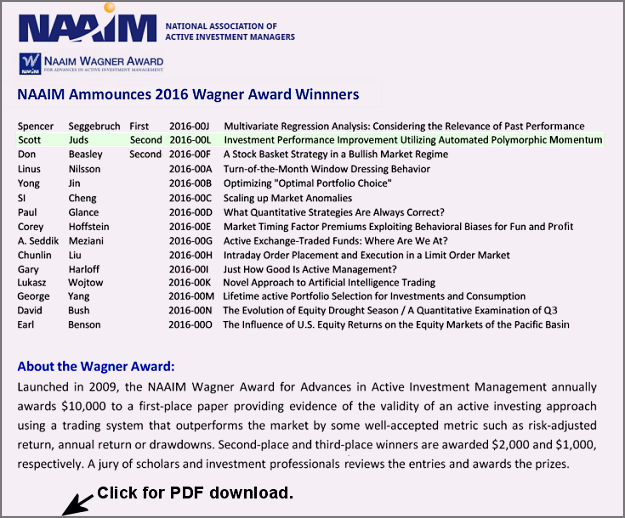 It is the return in excess of the compensation for the risk borne, and thus commonly used to assess active managers' performances. It is because SectorSurfer both reduces volatility during market crashes and has higher than usual returns that SectorSurfer has quite good alpha measurements. Each TopDog Strategy is based on a well known Stock Market Index, or an "Investment Theme" set of stocks, and includes a corresponding selection of up to 12 stocks. It is SectorSurfer's job to determine which one stock, and only one stock, from the set of 12 to own at any given time. 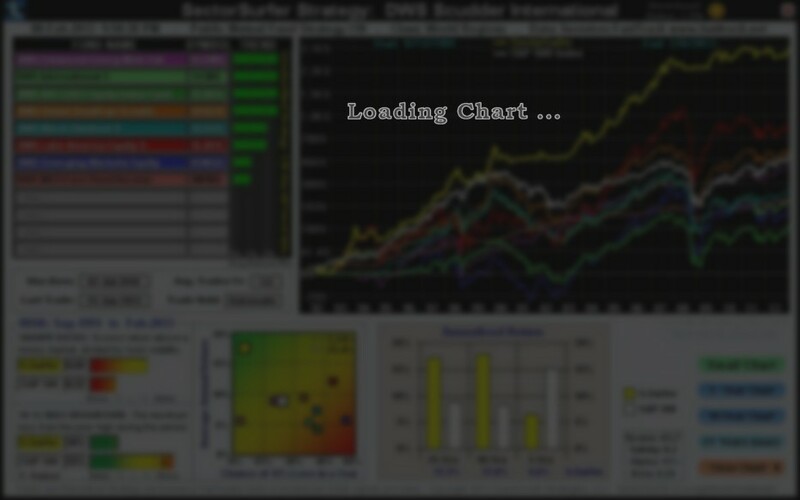 Simply by determining which of the stocks is the top trend leader and owning only that one stock SectorSurfer achieves the performance depicted by the yellow line on the Strategy charts below. 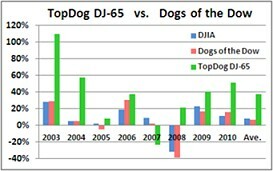 While the popular Dogs of the Dow investment strategy says an underdog with great dividends will likely lead the pack in the future, many underdogs truly are underperforming. It's not time to own an underdog until it actually becomes the TopDog trend leader. Our database, from FastTrack, contains well over 3,000 U.S. Stocks from the three major exchanges, which include many foreign Stocks listed for trading on the U.S. markets as an ADR (American Depositary Receipt). Popular market index lists are shown below for reference. However, we generally do not make new stocks available until they have about 3 years of data. SectorSurfer's algorithm cannot properly characterize a stock that has not seen a variety of market conditions, and you risk the possibility of unexpected Strategy behavior in the future. If you must have a stock with a shorter history, you may be in love with it for the wrong reason. The right reason is increasing the probability of higher returns and decreasing the probability of loss. Fresh hype is not a sound reason for a financial marriage — character matters. Our database also includes most of the Australian Stock Exchange ASX-100, all of the Toronto Stock Exchange TSX-60, and most the London Stock Exchange FTSE-100. The symbols for these stocks have ".A", ".T", or ".L" appended to them for their corresponding exchange to prevent confusion with possible duplicate ticker symbols on other exchanges. Unfortunately our system is currently limited to a maximum symbol length of five characters, thus the stocks with greater than three characters are too long in our system when the two-character suffix is added, and therefore have been excluded. When searching for these stock in our system, try entering just the two-letter suffix to specifically find these stocks.